I remember the 1994 eclipse. I was on the faculty at Ball State University, teaching chemistry and physics. 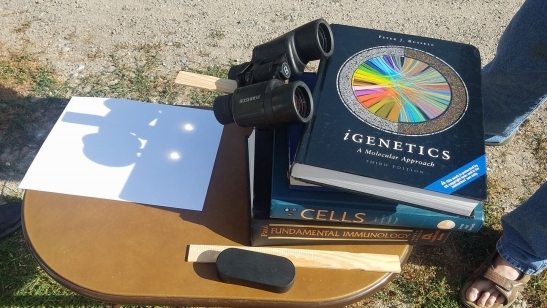 I told all my students about the eclipse, and when it came time to view it, I joined a few of the university’s staff watching the eclipse with welder’s goggles, pinhole viewers, and even natural pinhole viewers made by the foliage of the trees. As we watched, a few people joined in. Most of them had no idea that the eclipse was happening until they saw us looking at it. Well, the 2017 eclipse was very different! Because of social media, a lot more people knew about and planned for the eclipse, so my Facebook feed was filled with awesome photos of people watching the eclipse, the eclipse itself, and the effects that the eclipse had on the surroundings. While I agree that social media has a lot of negative effects on our culture, it also has some positive effects, and the eclipse highlighted one of those. Social media has made it much easier to “get the word out” on a variety of issues, including science-related events that people can experience. I thought I would share some of my photos of the eclipse as well as some better ones, providing “color commentary” as I go. Before I do that, however, I would like to just make a comment about how some people, like Eric Metaxas, view an eclipse as evidence for God’s existence. The argument goes something like this: the sun is 400 times larger than the moon, but it is also 389 times farther from the earth. As a result, they each take up roughly (not exactly) the same amount of space in the night sky. Without this pleasant “coincidence,” a total solar eclipse could not happen. Of course, it is no coincidence. It is another piece of evidence for the fact that our solar system is designed. While I think that nature explodes with evidence of design, I am not sure this is really one of those evidences. Sure, it represents an interesting example of “balance” between natural variables, and it certainly makes for an awesome sight. But honestly, it’s only four parameters (two distances from earth and two sizes). It’s not all that improbable for four different parameters to be balanced as a result of mere chance. In addition, those parameters are somewhat constrained, because we need a large moon for healthy oceans that can support life and a reasonably small, “gentle” star for our energy source. So while I think that the moon and the sun both provide strong evidence for the idea that our solar system is designed, I don’t think the fact that they can produce a total solar eclipse does. Of course, my amateur photos don’t do the eclipse justice, so I also want to show better ones, like the one at the top of the post, where NASA catches the International Space Station passing between the earth and the sun during the eclipse. Here’s a photo (click for credit), showing the total eclipse as seen in Corvallis, Oregon. 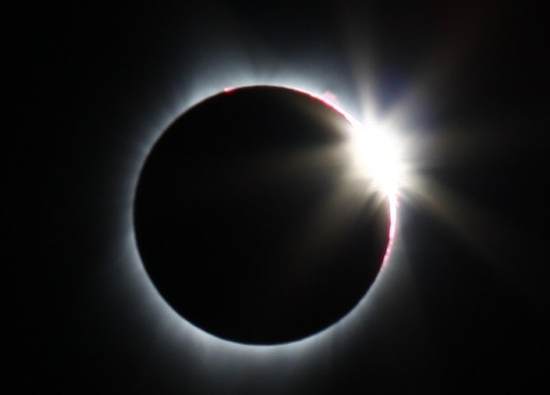 This is often called the “diamond ring effect,” caused by the fact that the moon’s surface is rugged, allowing a bead of light to pass through the eclipse. 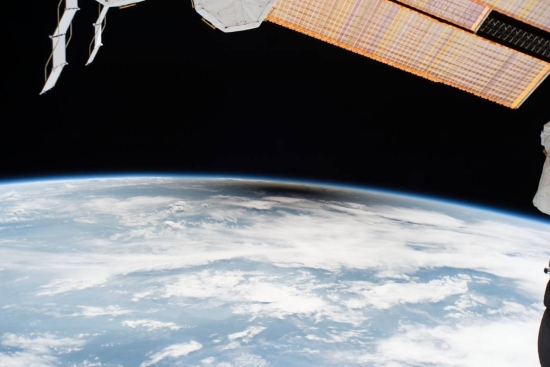 The dark spot you see is the core of the moon’s shadow being cast on the earth. It is called the umbra, and wherever it lands, you see an eclipse. Awesome post! It did not get too dark at our location but the discovery of the pin hole projection device absolutely blew my mind. PS: In a matter of days I will have finished Exploring Creation with Chemistry, and I just wanted to say, thank you! thank you! thank you! What an incredible adventure it has been, and I am so excited to start at least reading through ECW Physics even though I will be attending College next week!xD Do you think you would ever write a college level text? Thanks so much, NJ! I am certainly open to writing a college-level text, but I haven’t felt led to do that yet. I decided not to try to take any pictures and focused on experiencing the event, but I’ve enjoyed seeing the pictures of others and hearing their experiences through social media. I loved seeing other people’s pictures as well! So true about social media, it is yet another way for us to show we are both created in God’s image and badly marred. Love that ISS photo! My family traveled to southern Illinois to see the totality and it was something. My 3 year old and 18 month old had to be warned not to look as they noticed there was something weird about the sun at the crescent, but it was awesome to have them watch the full ring. Plus, even NASA can’t capture the ephemeral brilliance of the diamond ring (it’s not only shaped like one, it glitters like one). We’re going to do a report on this experience and what’s going on and perhaps later we’ll look for sunspots using your binocular technique. Praise God for such an awesome creation He has made. The heavens declare His glory indeed! I think the eclipse, distance, and size factors are evidence of God to us as observers, only in a more simplistic sense. There are two (other) ways to look at it. One is that if everything is merely measured by chance, then all things are possible including and especially God. Another is that if all things are ruled out, then even the most elementary evidence must also be ignored. Either way the same basic principle applies, that you either see evidence for God or not, and must disregard his very Spirit and all his creation to achieve atheism. Otherwise, it does present a problem for common dating methods. Of course chance is against evolution. Besides, we can just see how cool things are done by God just looking. Dr. Wile–When you said you saw the one in 1994, did you mean that you saw totality? I was very surprised to discover that there is a vast difference between totality and even 99%. If you haven’t seen totality, please, please, do not miss it next time–you will be awestruck by the beauty of it. I have not seen a picture that even half-way did it justice. It was so beautiful, like nothing else we have here on earth. The most eloquent, over-done description winds up feeling like an understatement. I hope you have seen totality at some point, but if you haven’t, I cannot recommend it highly enough. I have seen a total eclipse before. The 1994 one was annular. I mentioned it because I was on a college campus, so I thought more people would know about such things happening. Ok I’m not a scientist but isn’t the moon’s orbit another parameter that has to be ‘just right’? The moon isn’t required to orbit in a pattern that bring it so precisely between the earth and sun, does it? Even if the laws of physics do require it to orbit that way it is still another natural law ‘coincidence’ in favor or purpose and planning rather than chance, in my layman’s thinking anyway. I don’t think so. Since the earth has to be at one focus of the moon’s orbital ellipse, there will have to be a time when the moon is between the earth and the sun, no matter what the inclination of the orbit is. Now, the more inclined the orbit, the more rare the event would be. However, the orbit is already inclined by 5 degrees relative to the earth’s orbit around the sun, so these events could be a bit more common than they are. In addition, if the moon’s orbit were more circular, there would be more total eclipses, because a total eclipse happens only when the moon is closest to the earth (perigee), not when it is farthest from the earth (apogee).